When looking back over the years, a certain habit of Dominic Miller’s comes to the fore, which is his tendency to use progressing ordinal numbers for some of the titles of his solo albums. It all began with his debut album, "First Touch" (1995), followed later by "Second Nature" (1999), "Third World" (2004) and "Fourth Wall" (2006). Accordingly, the album to be released now bears the title "5th House". But why fifth house? "I wanted something with fifth in the title and this was the least obvious,” the guitarist explains. "Of course, I could just as well have chosen ‘the fifth element’ or ‘the fifth amendment to the constitution.’ In astrology, the fifth house means ‘the house of love and passion’.” And indeed, Miller’s latest oeuvre is a work brimming with love and passion. As in his previous releases, the musician with Argentinean-English origins has yet again invested plenty of blood, sweat and dedication in his work. He could not and would not want to do otherwise. Dominic Miller wrote the new songs on the road, while touring with Sting in 2010/11. "The mood of the songs reflects my own mood at that time,” he explains. "I even recorded the tracks on the road, starting in Los Angeles, after we had returned from New Zealand. That was the only chance for me to make sure that Vinnie Colaiuta and Jimmy Johnson actually had time to spare." These are the two most renowned guest musicians who helped Miller lay the foundation for "5th House" in the legendary Henson Studios in L.A. After this, he spent some time with his tour band in the Maarwegstudio2 in Cologne, where the overdubs were realised. The recordings were then given the final touches in the Studio Les Cypres in Provence, France, where Miller lives. Miller’s previous album, "November" (2010), had already been recorded in the exceptionally short time span of a mere fourteen days spent in the studio; however, "5th House" even exceeds this timing. All in all, recording the album took no more than seven days. Once he had the raw version, Miller went to London to work with his favourite sound engineer, Hugh Padgham. The two have been virtually inseparable ever since their collaboration for Phil Collins's million seller "But Seriously" in 1989. In the past two decades, they have worked together for a large variety of projects. By now, they have a blind understanding for each other, which is why it took them virtually no time at all to agree on the final mastering for "5th House". "We mastered two songs per day," Miller recalls. "The entire process of recording and mixing was done within twelve days, no more. Now, if I recall the 90s in comparison – in those days, it would have taken me twelve weeks, at least. Of course, the end result might have sounded more polished, but I prefer it this way. This is the way many of my favourite albums of the 60s and 70s were produced: really fast!" 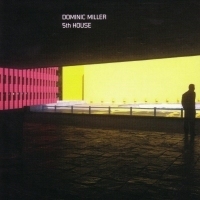 For the recordings of "5th House", Dominic Miller managed to assemble a group of internationally renowned top-notch sidemen. Vinnie Colaiuta, for example, to Miller is "the greatest drummer of our generation" – known for his flawless drum technique and stylistic versatility, in the course of the years he has collaborated with the likes of artists such as Frank Zappa, Joni Mitchell, Megadeth, Leonard Cohen, Chaka Khan and Sting. Jimmy Johnson is a legendary bassist and has been amongst the top musicians of the USA for decades, working with James Taylor, Stan Getz, Roger Waters, Sergio Mendes and Lee Ritenour, to name but a few. Another renowned bass player is Welshman Pino Palladino, who has worked with the likes of the John Mayer Trio, Paul Young, The Who, David Gilmour and Peter Gabriel. Finally, mention must be made of the pianist Yaron Herman from Israel, who now resides in Paris and whose exceptionally cultivated way of playing proves him to be a rising star at the piano, one about whom we will certainly hear much in the future. Dominic Miller then combined this eclectic mix of international music luminaries with the members of his tour band, who are equally worthy of praise. Rhani Krija is a highly recommended percussionist from Morocco who meanwhile lives in Cologne and has performed with Omar Sosa, Keziah Jones and Salif Keïta. Bassist Nicolas Fiszman has made a name for himself collaborating with Pili-Pili, Charlie Mariano, Johnny Clegg and Khadja Nin. And finally, there is Mike Lindup, well-known from Level 42, who has for many years been Dominic Miller’s favourite keyboarder. In fact, the two of them have worked together ever since they first met when Miller was eighteen years old. "He is the best all-round musician I know,” Miller raves about him. "The way we work together is virtually based on telepathy." This is the dream cast which supported Dominic Miller to create one of the most outstanding instrumental albums of his career; a career which virtually features highlights like pearls on a string. Once again, the guitarist manages to impress us with a large variety of different styles and unexpected turns. His programme includes fantastic, dreamlike soundscapes where he creates harp-like sounds on his acoustic guitar ("Angel"); then again he produces galvanizing guitar sounds reminiscent of The Police ("If Only"). "Embrace" is a convincing soft-jazz track, whereas "Waves" is carried by the flair of Bossa Nova sounds, and classicist-sounding guitar arpeggios ("Catalan") alternate with full-volume band rock sounds ("Dead Head"). "5th House" is another momentous highlight in Miller’s already impressive biography. Born in Buenos Aires to an American father and an Irish mother, Miller studied guitar at the renowned Berklee College in Boston and at the London Guildhall School Of Music. He has been a highly coveted session musician since the late 1980s. The list of artists he has worked with is sheer endless; among his collaborations are The Chieftains ("Long Black Veil"), Eddi Reader ("Mirmama"), Manu Dibango ("Wakafrika") and Tina Turner ("Wildest Dreams"). As of "The Soul Cages" (1991), Miller has also been involved in every single album produced by Sting; he has been on stage with the former vocalist of The Police more than a thousand times, and was involved in the creation of hit songs such as "Shape Of My Heart". Sting once even described his faithful companion as "my right and my left hand, which brings to life all that my clumsy fingers cannot play." Visit Dominic Miller's website at dominicmiller.com or pre-order the album from dominicmiller.com/store.